The San Diego Fire Rescue Foundation on Friday held an awards ceremony to recognize the men and women who put their lives on the line to keep San Diegans safe. 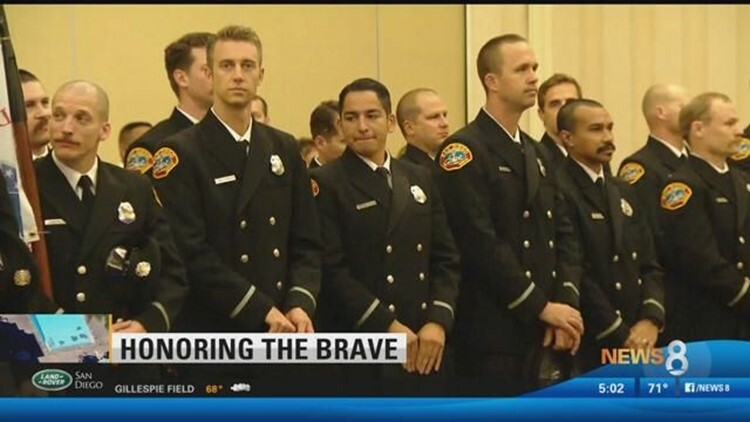 SAN DIEGO (NEWS 8) – The San Diego Fire Rescue Foundation on Friday held an awards ceremony to recognize the men and women who put their lives on the line to keep San Diegans safe. Among the brave first responders who were honored were two firefighters who bravely responded to the scene of the deadly La Jolla pool party shooting in April. The pair of firefighters accepted the city’s Lifesaving Citation on behalf of their Fire Engine 35. “It’s humbling. It’s an honor to receive this award,” said Bryan Bujarski. For firefighter and paramedic Michael Culver, it’s a day he will never forget. “We heard that there was more shooting. There was still an active shooting going on and more victims than originally thought, so we self-dispatched ourselves,” said Culver. Bujarski said the apartment complex security guard brought the injured to them immediately. “We had no idea we were going into an active shooter incident. We were actually first exposed to the patients. They all jumped out of the car – the security car that was right in front of our engine,” said Bujarski. As victims ran for safety, seven people were injured and one woman, 35-year-old mother of three, Monique Clark, was shot and killed. "It's just part of the job. It sticks with you, but at the same time we all talked about it. We all agreed that everything was done within our power to the best of our abilities,” said Culver. The City of San Diego also honoring the firefighter of the year, Kurtis Bennett. Also honored were the volunteers of the year and local civilians who did rescues. "Taking action quick and decisions is necessary outside of what's expected in our day to day things of firefighters,” said Chief Brian Fennessy, San Diego Fire Department. The poolside rescuers credit their quick actions to training. “It's a lot of chaos, and so that's where our training kicks in - just keep a cool head and we have a way of training in treating and organizing a scene like that,” said Bujarski.